According to drug enforcement officials, drug trafficking into South Florida is happening at a higher rate than it has at any point in the last decade. In the past year, Customs and Border Protection officers confiscated approximately 9,500 pounds of cocaine being moved into the nation through Florida. Cocaine overdose deaths in Florida are at their highest level since 2007. Because of the lag in time between production and distribution, even more cocaine is predicted to enter South Florida this year and next. Possession and trafficking of cocaine is a criminal offense in Florida and throughout the United States. Individuals charged with drug crimes can face steep penalties, such as fines and incarceration. Where is the Cocaine Coming From? Nearly all of the cocaine entering the United States through Florida is coming from Colombia. Production in the nation has tripled, surpassing its previous height during the 1980s. Experts say the increase is due to Colombia halting the aerial spraying of herbicides on its cocoa fields. The increase in cocaine production in Colombia is driving down its cost to consumers in the United States. Today, one kilo, approximately 2.2 pounds, of pure cocaine is worth between $26,000 and $28,000. Two to three years ago, it was worth $28,000 to $35,000. Cocaine is a Schedule II controlled dangerous substance. Trafficking cocaine is the act of knowingly selling, manufacturing, purchasing, delivering, or bringing the substance into the state. Cocaine trafficking is a first degree felony. Individuals convicted of trafficking at least 28 grams of cocaine, either pure or adulterated, but less than 150 kilograms, he or she will be incarcerated and face steep fines. 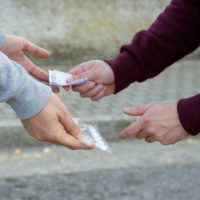 The length of the convicted individual’s prison sentence and amount of his or her fine depends on the amount of cocaine he or she trafficked. If the amount was between 400 grams and 150 kilograms, the defendant must spend at least 15 years in prison and pay a fine of $250,000. The sentence for trafficking more than 150 kilograms of cocaine is life in prison without the possibility of discretionary early release except for in cases such as pardon, conditional medical release, and clemency. When an individual is convicted of killing another person or otherwise causing another’s death through cocaine trafficking, he or she can face additional, steeper penalties. A drug conviction will change your life forever. If you are facing any type of drug-related charge, start working with an experienced Miami criminal defense lawyer as soon as possible to develop an effective defense strategy for your case. Contact our team at Ratzan & Faccidomo, LLC today to set up your initial consultation in our office.